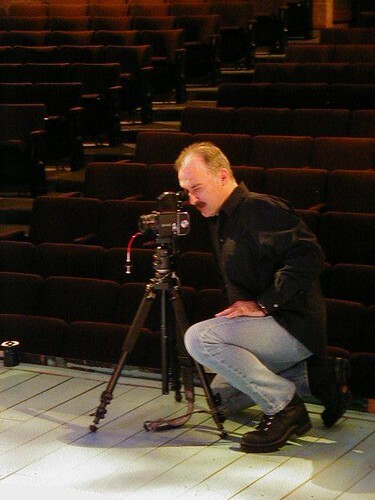 Patric McWilliams, River City Rep, Shreveport-Bossier / Neil Johnson, a photo by trudeau on Flickr. 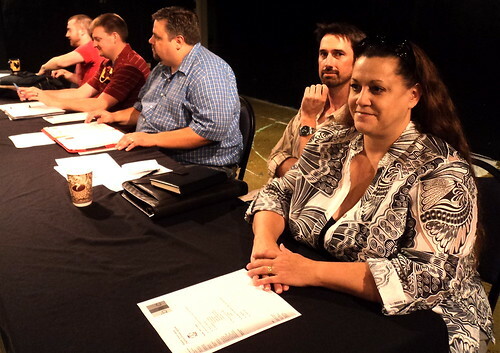 "We're doing an exciting and unique take on our season this year," says Patric McWilliams, artistic director at River City Rep.
"We're "presenting" the first production, "Dodging Bullets," rather than "producing" it. It's a one man show we're bringing in from Phoenix, built on the actor's actual experience of having his abusive brother-in-law shoot his sister right in front of him and then fire a number of bullets at him which he dodged. Thus the title. Then we're coming back with our own production of "The Night of the Iguana" (late Jan), a reading of the play "8, " about the court trials of the Proposition 8 situation in California (early Feb....we were chosen specifically to participate in this national project), then the Tony Award and Pulitizer Prize-winning one man show, "I am my own Wife," (which will have Robert Buseick directing and me starring), a production of "Art," ( early May with Blayne Weaver) and then we'll end the season with "The Gin Game," (June) starring Academy Award nominee Margaret Avery (The Color Purple). Our most ambitious season but happily we are stepping forward and seeing positive things on the horizon." River City Rep presents one-man drama, Dodging Bullets, a photo by trudeau on Flickr. River City Rep at East Bank Theater: the one-man show, Dodging Bullets. 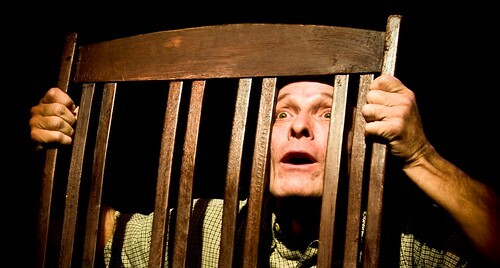 Starring the actor-playwright, David Barker. Box office open Aug 27. "Come join us tonight at Chianti's Italian restaurant," says Christopher Allen. "I will be there tonight from 6 to 9 with Winston Hall. 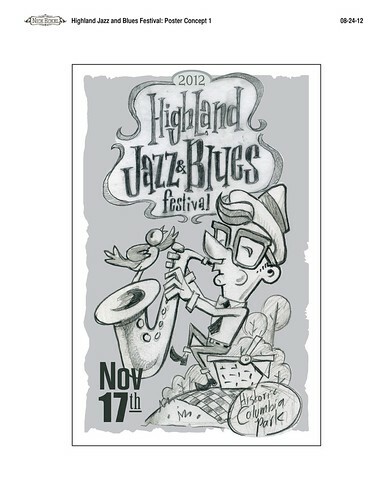 We will be serving up some fine jazz, blues and rock or who knows what. Mixing it with some fine Italian food; sounds great to me ! Located at 6570 Line Ave. near 70th St. 868-8866." 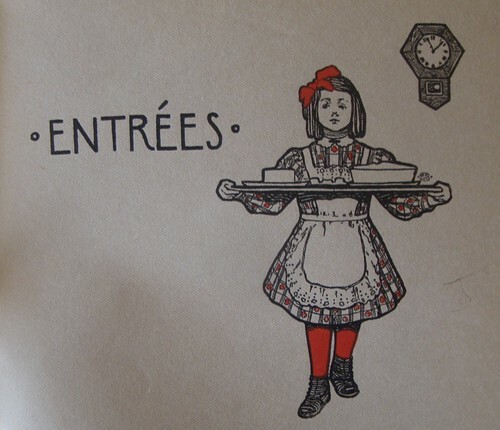 1920's recipe book graphics, a photo by trudeau on Flickr. Bibliophile and vinyl alert: the Centenary Book Bazaar will be held Fri, Sept 4 to 9 pm, and Sat, Sept 8, 9 to 4 pm, in the college's Gold Dome center. - 50 categories of paperback books, hardback books, DVDs, VHS, CDs, cassette tapes, and puzzles. - 2,500 vintage children's books,. - higher-priced rare items reserved for bid auction. Bring bags or boxes to carry out books. Carryout assistance is available. Cash or check. On Saturday, all items become half-priced after 1:00 p.m. The Book Bazaar is organized and sponsored by the Muses, a philanthropic group dedicated to funding projects and programs for Centenary students. 318.219.3409 or David Williams at 318.869.5162. 2012, a photo by trudeau on Flickr. 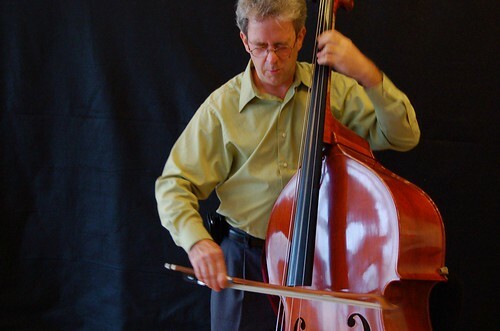 Re-imagine our detrital past with Doug and Chris Fitch at Artspace Shreveport beginning on Fri, Aug 24, 5 to 8 pm. $10 admission to the opening party. The Fitch Bros along with artists Julie Glass, Jeormie Journell, James Marks and Roald Simonson (of Juneau, Alaska) have built a swamp inside Artspace, endeavoring to make an artful display and one that will prick imaginations. Shreveport Regional Arts Council invites viewers to enter the swamp to explore. To question. To reflect. peekersposter, a photo by trudeau on Flickr. The Peekers make romantic, melodic folk rock and are fronted by 2 charismatic and richly-talented singer-songwriters, Brittney Maddox and John Christopher Martin. 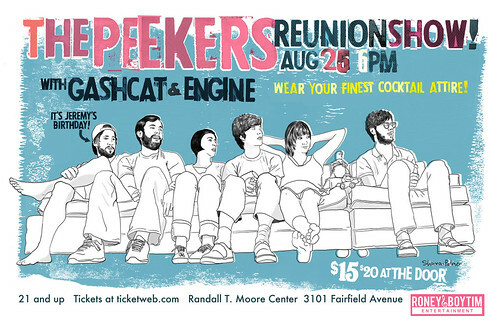 It's good news that they're partying at the handsome and romantic Moore mansion on Fairfield. $15 includes food provided by Stir, the Boytim & Roney restaurant. Highly recommended, especially if you missed them at their peak of shakin' and harmonizin'. Fitch Bros, Artspace Shreveport / installation La Plus Belle Poubelle, a photo by trudeau on Flickr. Chris Fitch, from Boston, and Doug Fitch, NYC, are preparing an installation in Artspace Shreveport that opens Fri, Aug 24. The Fitch brothers are artists who have fashioned a career in making art. That's not an easy thing to pull off. That's why the regional arts council, SRAC, is announcing the start of the Artists as Entrepreneurs Intensive Training Program. It will be facilitated by the regionally renowned Arts Council of New Orleans. 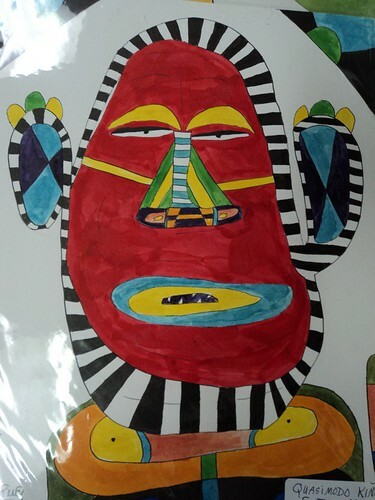 The goal of this program is to transition Professional Artists into income producing Artists increasing their capacity to earn income through their art. Combining lecture and small work groups, the program takes Artists through the development of marketing materials, branding, web and social media development, creating a business plan, profit and loss statements and career outlets such as galleries, museums, markets, festivals and public art. ACNO will host 4 workshops over a 4 week time period on topics related to growing the entrepreneurial skills of artists. Cost to attend the workshops is $15.00 per session/person. Juried Roster Artists and 501c3 Art Organizations may attend at no charge. 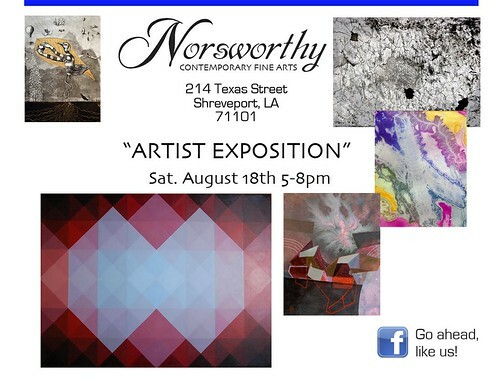 Workshops will be held at artspace, 710 Texas Street in Shreveport. Please RSVP via email to vickie@shrevearts.org. Week 1 Visual Arts Marketing 101 – Tuesday, August 21, 5:00 – 7:00 p.m.
Week 2 Social Media and Email Marketing – Tuesday, August 28, 5:00 – 7:00 p.m.
Week 3 Basic Photoshop for Artists – Tuesday, September 11, 5:00 – 7:00 p.m.
Week 4 To be or not to Be 501c3 – Tuesday, September 18, 5:00 – 7:00 p.m.
For more information contact Vickie Marshall at 318-673-6500. Artspace Shreveport has begun to look like a forest from the Maurice Sendak storybook. 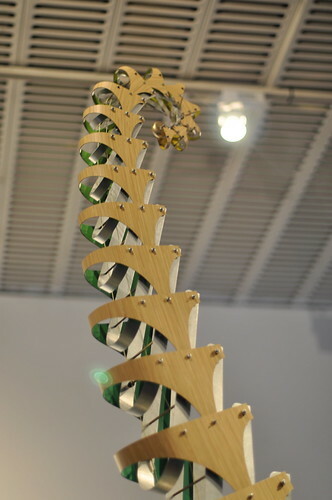 But most of the sketching is being executed via cannily-connected wooden objects found in the garages and warehouses of this fair city. Sustained labor on and off ladders and scaffolding saw the Fitch Bros gang install several multi-piece limb constructions on the pillar/trees in Artspace Shreveport on Sunday. Also raised and secured was a giant sheath and scrim on the long wall. Virtually all the found objects are being transformed onsite and sawn, screwed and slaved into place. La Plus Belle Poubelle will present one of the most thorough transformations of Artspace to date. It opens Fri, Aug 24, 5 to 8 pm. $10 admission. 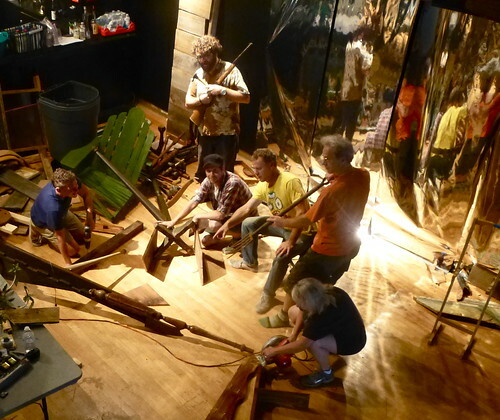 Artists hammering and wielding sizable power tools alongside Chris and Doug Fitch are Julie Glass, Jeormie Journell, James Marks and Roald Simonson. Among their additional helpers: Taffie Garsee, Michael Miller, Carrie Journell. And more. See more photos. And a 1:36 video. 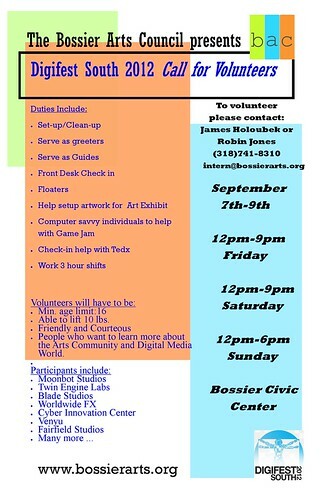 Cool volunteer hours: help run digifest Sept 7 - 9, Bossier Civic Center, a photo by trudeau on Flickr. Digifest South is Shreveport-Bossier at its best. Like the Louisiana Film Prize, this is an event positioned to grow and spark a lot of talent. Volunteers, or thinking-that-you-might volunteer, please see James Holoubek at 318-834-2281. Shreveport's Gay & Lesbian Film Fest, Sept 7 - 13, RFC, a photo by trudeau on Flickr. 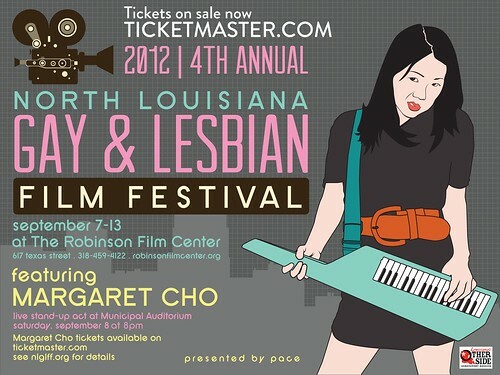 Shreveport's 4th annual Gay & Lesbian Film Fest (yes, Shreveport) arrives at Robinson Film Center Sept 7 - 13. Details at pacelouisiana.org. Tickets to the stand-up performance by Margaret Cho at ticketmaster.com. 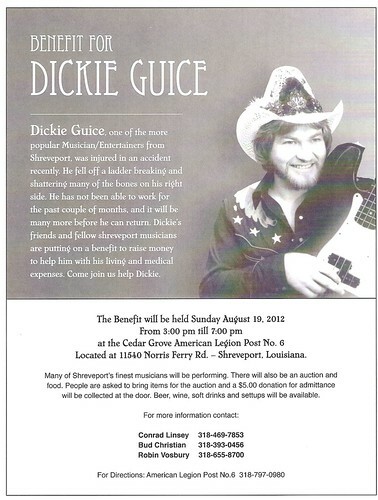 Dickie Guice benefit Sun, Aug 19, Cedar Grove Amer Legion, a photo by trudeau on Flickr. 411406_449670585065256_1869491437_o, a photo by trudeau on Flickr. 169556_4503049499394_1968604341_o, a photo by trudeau on Flickr. 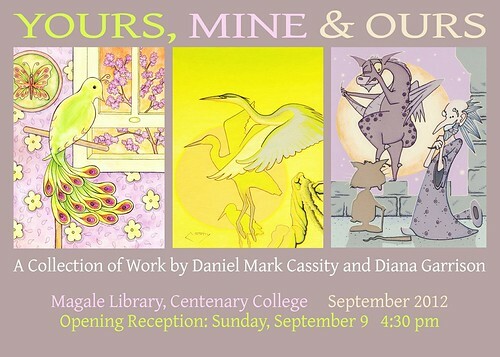 Highly recommended show by regarded realist painter Daniel Cassity and color-happy illustrator Diana Garrison. The curator at Magale producing shows with numerous capable artists is Kristi Kohl. Chris Fitch (Boston) and Doug Fitch (NYC) will haunt swamp and warehouse for charming rubbish in making a salvage landscape in Artspace Shreveport in August. 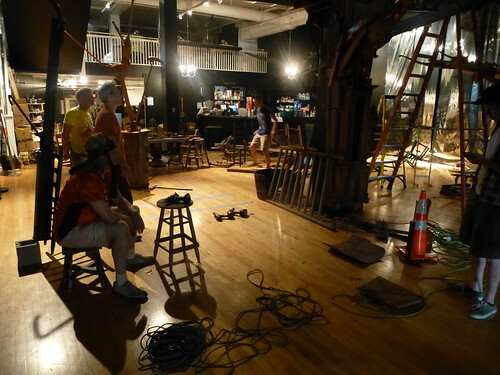 Watch them work until the opening party, Fri, Aug 24. Artists Jeormie Journell, Julie Glass and James Marks collaborate. 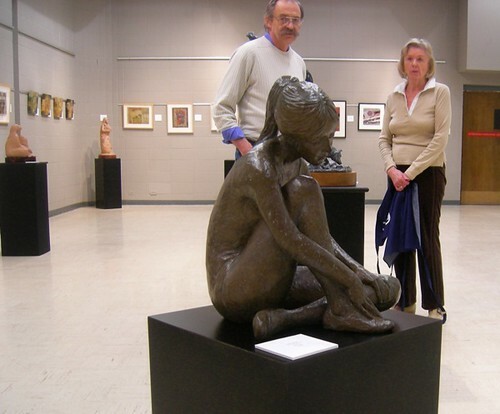 Exhibit on display until Oct 20. 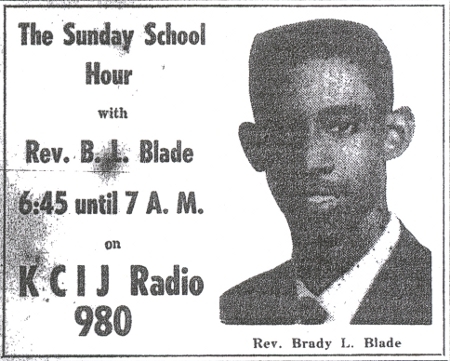 The Sunday School Hour -- tune in from 6:45 to 7:00. (Shreveport Sun [Shreveport, LA], July 1, 1965). In 2012, you might know of Rev. Brady L. Blade, Sr. because he serves as pastor of Zion Baptist Church in Shreveport. Or because in recent years he’s taken the gospel concert program Hallelujah Train on the road. Or because he and his church’s choir appeared in Daniel Lanois’s documentary film Here Is What Is. Or because of his renowned drummer sons, Brady L. Blade, Jr. and Brian Blade. I suspect 30 or even 50 years ago people knew of Rev. Blade for similar reasons – his ministry and his music. In 1982, Blade released a 45 containing “By His Grace We've Come A Long Way.” Based on the recording, it’s pretty clear this is sourced from a live performance likely recorded at his church, Zion Baptist. 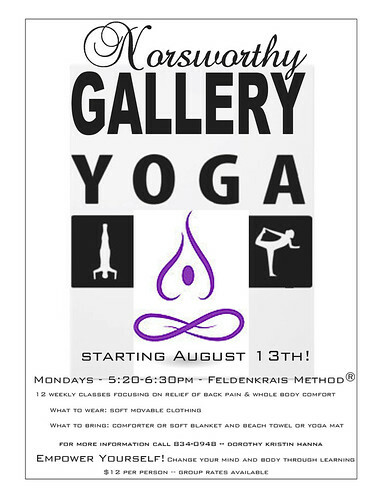 Texas St yoga with Feldenkrais instructor Dorothy Kristin Hanna at Norsworthy Gallery on Mons, 5:20 - 6:30 pm, a photo by trudeau on Flickr. 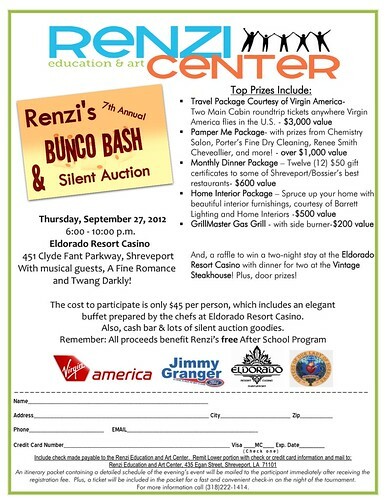 2012 bunco flyer, a photo by trudeau on Flickr. Spring, Chris Fitch, a photo by axiom_art on Flickr. Jeormie Journell, James Marks and Julie Glass are the artists who won places alongside the globally-acclaimed Chris and Doug Fitch in creating an installation in Artspace to be called "La Plus Belle Poubelle," or "Economy of Means in a Mean Economy." The show runs from Aug 24 to Oct 20, says Artspaceshreveport.com. Curious about the French title and the actual installation? The brothers Fitch will explain themselves and their artistic intent at Artspace on Fri, Aug 10, 6 pm. Turning point in the life of the Barnwell Garden and Art Center: city officials ask, "What would you like to see in this river front institution?" Barnwell exhibit, a photo by trudeau on Flickr. Center, says Jillene falk. They are seeking input from the community about the future plans for the Barnwell Center following renovations in 2013. All Barnwell stakeholders (members, patrons, artists, horticulture clubs, skateboarders, etc.) are encouraged to attend to express their views about the future of the Barnwell and the planned construction. DigiFest South: artist deadline Aug 10 / Nolan Baker, James Holoubeck, Wade McDougal, Clint McCommon, Theresa Ratcliff, a photo by trudeau on Flickr. DigiFest is shaping up as multi-winged stallion of a fest, participants learned at the DigiFest Forum. First announcement was a bit more time for artists submissions. The new deadline is Aug 10, says Theresa Ratcliff. The Game Jam, managed by Nolan Baker, will need more than programmers and graphic designers; electronic soundscapers are also needed. Volunteers to man booths, oversee and maintain displays will be essential to production of a successful fest. James Holoubeck will solicit and organize vols. Wade McDougal is producing the Phenom Film fest under the aegis of DigiFest. His goal is to screen an allotment of the numerous and worthy indie films being made today that will not make it to a theater. Clint McCommon and Theresa Ratcliff are sizing up the artists' entries (an example: a digital bed - a sleeping bed - submitted by a student architect) and developing display plans for this first-ever event. The event will take place at Bossier Civic Center on Sept 7 to 9. More at DigiFest South. New Orleans artist Robert Rue, a photo by trudeau on Flickr. The New Orleans Fringe Fest is an alternative theater festival scheduled for Nov. 14 to 18, says Doug McCash at Nola.com. In addition to the 24 venues managed by Fringe Fest (deadline was July 2), performers may apply for “BYOV” slots in the fest (deadline Sept 15). Inspired by the Edinburgh Fringe, the NO Fringe has been at work since 2008.